The Indus Valley civilization, one of the oldest in the world, goes back at least 5,000 years. Aryan tribes from the northwest invaded about 1500 B.C. ; their merger with the earlier inhabitants created classical Indian culture. Arab incursions starting in the 8th century and Turkish in 12th were followed by European traders beginning in the late 15th century. By the 19th century, Britain had assumed political control of virtually all Indian lands. Nonviolent resistance to British colonialism under Mohandas GANDHI and Jawaharlal NEHRU led to independence in 1947. The subcontinent was divided into the secular state of India and the smaller Muslim state of Pakistan. A third war between the two countries in 1971 resulted in East Pakistan becoming the separate nation of Bangladesh. Fundamental concerns in India include the ongoing dispute with Pakistan over Kashmir, massive overpopulation, environmental degradation, extensive poverty, and ethnic strife, all this despite impressive gains in economic investment and output. India's economy encompasses traditional village farming, modern agriculture, handicrafts, a wide range of modern industries, and a multitude of support services. More than a third of the population is too poor to be able to afford an adequate diet. India's international payments position remained strong in 2000 with adequate foreign exchange reserves, moderately depreciating nominal exchange rates, and booming exports of software services. Growth in manufacturing output slowed, and electricity shortages continue in many regions. 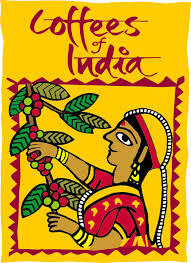 Indian coffees are under-represented in the coffee market: they are good balanced, mild coffees. You will find the pronounced body, low acidity and subtle spicy notes pleasing, and the Mysore coffees work well under a wide range of roasts. Sometimes you find hints of earthiness, similar to Indonesian origins like Sulawesi and Sumatra. They are also nice in espresso. India produces wet-processed and dry-processed coffees: dry-processed coffees are called "Cherry" and wet-processed arabica is called "Plantation Arabica" whereas wet-processed robusta is called "Parchment Robusta." If you want reviews of Premium Indian Robustas for use in espresso blends, see article below. Monsooned coffees are stored in special warehouses until the Monsoon season comes around. The sides of the structure are opened and moist monsoon winds circulate around the coffee making it swell in size and take on a mellowed but aggressive, musty flavor. 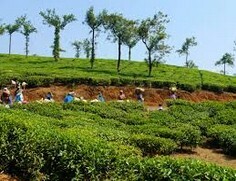 Our source for Monsooned Malabar is the Coehlo's Gold brand from the Silver Cloud Estate. Silver Cloud Estate was founded in 1950 by Gregory Joseph Coelho, the scion of an illustrious family of planters - whose coffee growing traditions, date back to the early part of the 20th century. In thier monsooning process, arabica coffee is spread on the floor of the special monsooning warehouse in Mangalore, raked and turned around by hand to enable them to soak in moisture of the humid winds. The monsooning process takes around 12 to 16 months of duration, where in the beans swell to twice their original size and turn into pale golden colour.Then there are additional hand-sortings to remove any coffee that did not expand properly, and the coffe is prepared for export. This is an extremely earthy, musty, pungent cup with a unique combination of carmelly finish and potent flavors. It is not for those who like a "clean" cup, or sweet coffees! It has some use in espresso blending with a preparation of longer drum roasting and resting (after roasting) of 3+ days. There are Italian espresso roasting companies that use this coffee in their "exotic" blend offering, along with 2-3 other non-monsooned arabicas to even out the cup and provide aroma and some sweetness ... for example Cafes Trottet. Even as a drip/infusion brew, the coffee mellows after 2 days and the cup is more balanced so resting is key to best cup results. City if you dare, Full City for maximum drinkability, and no darker or you lose the funk. liquor of the gods or sewer water, depending on who you ask. I love it, and think everyone should try it!. 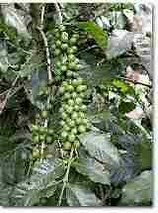 Robusta coffee is the trade name for Coffea canephora, a different species of coffee from the genus Coffea and cousin to the higher-grown Coffea arabica L. that is the basis for specialty coffee. You may be interested to know that the bulk of cheap coffee in the world is actually arabica, not Robusta. Arabica accounts for 75% of the worlds coffee production with the top 5% qualifying as Specialty Coffee (the coffee Sweet Maria's and other fine coffee roasters stock). 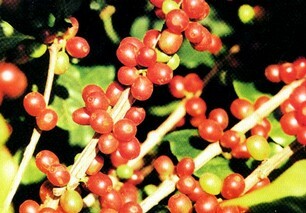 Robusta accounts for 25% of the coffee production. There is a LOT of very low grade Robusta out there, used to pump up caffeine content and as a cheap filler in institutional coffee. We offer some high grade robusta but I must confess this to you: I have difficulty telling the difference between 12% of a haigh quality Java or PNG washed robusta in an espressp blend, and a more expensive name-brand Indian one. I just think you reach a quality threshold and anything above it is "good enough". Robusta will never be arabica, in this respect.